A pause that refreshes, or signs of a double dip? It’s not just the manufacturing sector that saw a slowdown in November. According to the HSBC Markit Purchasing Managers’ Index (PMI) data for the Indian services sector, business activity fell to 55.20 last month from 56.78 in October. A reading above 50 signifies expansion, so the growth continues, albeit at a more sedate pace. More worrying is the new business sub-index, which fell to its lowest in six months. Also, despite the stories of companies stepping up hiring, the employment sub-index for the services sector was a borderline 50.93 in November. 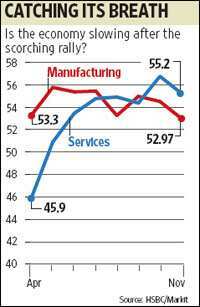 Nevertheless, the PMI for services is now higher than for manufacturing, which is a good thing considering that services have a much larger weight in the economy. Could this be a sign that after the scorching rally in the September quarter, the economy is pausing to catch its breath? If so, this won’t be the first time that has happened. During the last downturn, for instance, the growth rate in manufacturing fell to dismal levels in 2001-02 after the dotcom bust, improved substantially in 2002-03, decelerated in 2003-04 and then roared back at full speed in 2004-05. Of course, the base effect had a lot to do with it. The US economy in the early 1990s also saw a double dip after the savings and loan crisis, which too was a housing sector bust. After contracting by 0.2% in 1991, it grew by 3.4% in 1992 only to fall back again to a growth rate of 2.9% in 1993. The global economy too saw a pause in November, with the JP Morgan Global All-Industry Output Index, which is the combined world manufacturing and services PMI, falling to 51.6 during the month. This has been the slowest rate of increase during the current recovery. Is this the pause that refreshes, or the beginning of the much-feared double dip? The upbeat US payroll numbers on Friday point to the former.